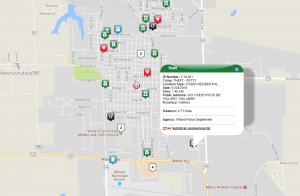 The Willard Police Department recently launched their community crime mapping portal with APSS partner LexisNexis. Residents can check the Community Crime Map for the area and even report a tip to the Police Department regarding the crime. Crime mapping not only aids law enforcement in crime patterns, but also keeps residents informed about crime in their area. This is just another example of the power of the APSS Product Suite and our APSS Partners working together. Congratulations to Willard Police Department on a smooth implementation and your continued transparency in the community you protect.